Non-invasive mitral valve replacement in dogs…is a viable option on the horizon? Borgarelli M, Buchanan JW. Historical review, epidemiology and natural history of degenerative mitral valve disease. J Vet Cardiol 2012;14:93-101). Chronic mitral valve disease, secondary to myxomatous degeneration is the most common type of heart disease in dogs, accounting for over 70% of heart disease in canines. It has been known to potentially result in congestive heart failure in this species for over 100 years with approximately 30% of dogs who develop the disease eventually developing congestive heart failure.Typically a long pre-clinical period occurs, characterized by morphologic changes that can progress to mitral valve leakage, secondary chamber enlargement, and potentially the development of congestive heart failure years later. Similar degenerative changes are known to occur in both dogs and humans as they age. The prevalence of mitral valve disease in dogs affects between 3-7% of dogs or 2.3-5.3 million dogs, based on the current estimates of the canine population in the US. Fig. 1: The Cavalier King Charles Spaniel is a breed highly predisposed to the development of myxomatous mitral valve disease which is now known to be passed on through a polygenic mode of inheritance. 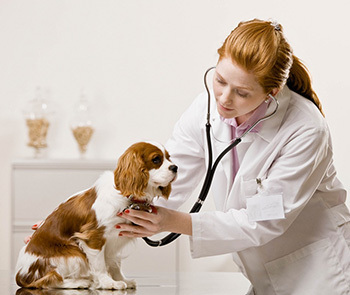 Small breed dogs are most commonly affected, with the prevalence in some breeds like the Cavalier King Charles Spaniel approaching nearly 100% within a lifetime. Highly susceptible breeds such as the Cavalier King Charles Spaniel and Dachshund are now known to pass the disease on through a polygenic mode of inheritance. In dogs, the pathology of myxomatous degeneration is grossly recognized by greyish-white, smooth glistening nodules, often situated on the atrial side of the mitral valve leaflets. In both dogs and humans, inflammatory cells are notably absent from degenerative mitral valves, and therefore inflammation does not appear to play a prominent role in the pathogenesis of this disease. Surgical repair of degenerated mitral valves in humans has focused on mitral valve replacement, or mitral valve repair. Options for mitral valve replacement include mechanical or bioprosthetic valves which typically are made of reinforced porcine tissue. Dogs do to not tolerate mechanical valves well due to a high incidence of thrombogeniticity. 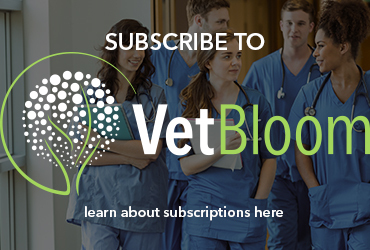 Porcine valves appear to be a better option, with recent reports of dogs maintaining them without any thrombogenic side effects for up to twelve months after replacement. Long-term human studies have shown an advantage with mitral valve repair over replacement, with a proven increase in survival and durability. The most common procedures performed in mitral valve repair include, annuloplasty (Fig. 2), edge-to-edge repair (Fig. 3), and chordae tendineae repair or artificial chordae tendineae replacement. Fig. 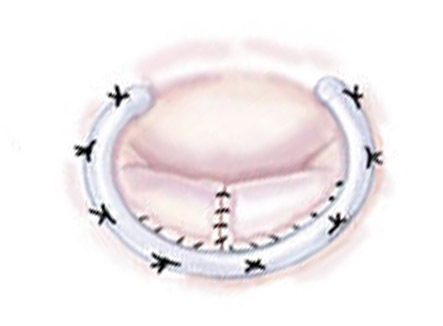 2: A mitral valve annuloplasty adjusts the diameter of the valve annulus by using a purse-string surgical technique to effectively decrease the annulus diameter. Fig. 3: A mitral valve edge-to-edge repair involves attachment of the free edge of the anterior leaflet to the free edge of the posterior leaflet which results in a double orifice opening in the valve. 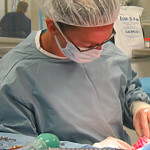 An annuloplasty adjusts the diameter of the valve annulus by using a purse-string surgical technique to effectively decrease the annulus diameter. 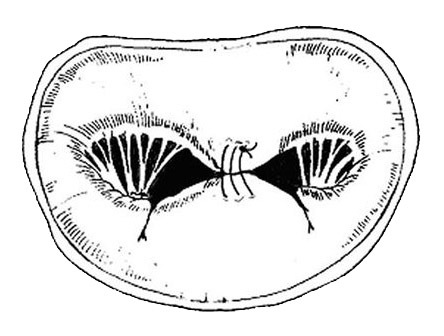 An edge-to-edge repair involves attachment of the free edge of a prolapsed leaflet to the free edge of the opposing leaflet, which results in a double orifice opening in the valve. Chordae tendineae are crucial in maintaining integrity of the valve and their length can be surgically adjusted to adjoining papillary muscles, or an artificial chordae tendineae can be inserted. Fig. 4: A transapical approach through the left ventricle has been the experimental method for delivery of the MitralSeal device. 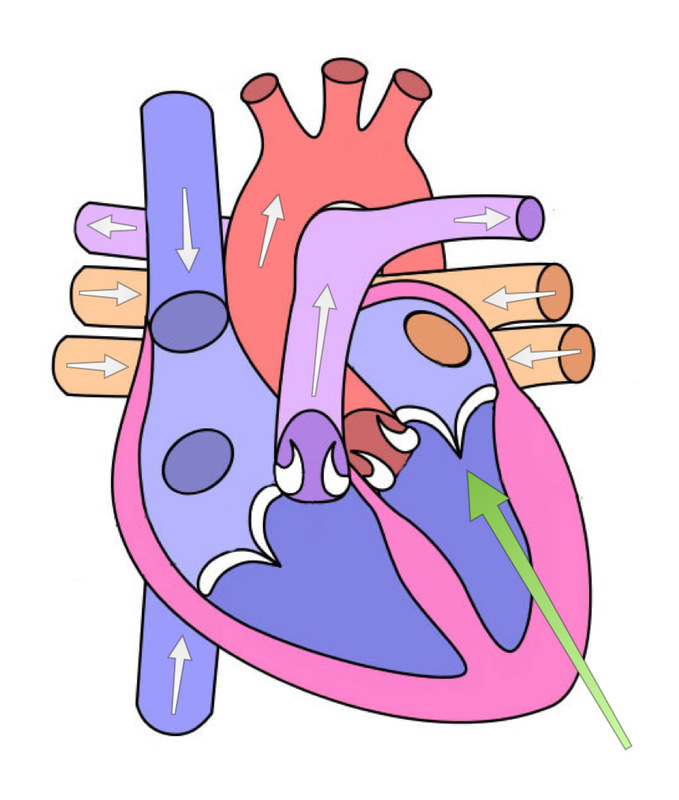 The pericardium is opened and a needle puncture is performed through the left ventricle (green arrow) to introduce the delivery system into the heart. Newer therapies continue to be developed for both congenital and acquired lesions that could have previously only be corrected by means of traditional open heart surgery. Non-invasive procedures involving a transvascular approach that are currently utilized in veterinary patients include balloon valvuloplasty or PDA occlusion with the Amplatz canine ductal occluder. These procedures gain access to the heart through a vascular approach, with entry into the jugular vein or femoral vein for access to the right heart, vs. femoral artery or carotid artery for access to the left heart. The main benefit of a percutaneous approach is the advantage of being much less invasive than traditional open heart surgery. The primary disadvantage to this approach is that it places limits on the size of the delivery catheters and devices that can be used, which can be limiting in very small patients. A transcardiac approach is a more invasive approach to the heart that requires a small thoracotomy to gain access to the outside of the heart through the left ventricle (Fig. 4). Access can be gained by a caudal sternotomy or a left thoracotomy. The advantage of this approach is that it allows larger catheters and devices to be used. This has expanded options in the development of new devices that can be used in mitral valve repair/ replacement. Disadvantages of this approach include the need for hybrid operating rooms with fluoroscopy, transesophageal echocardiography, or intracardiac echocardiography, and requires a team of both a surgeon and a cardiologist. Surprisingly, a non-invasive mitral valve replacement has not yet been developed for use in humans. Several designs are currently being investigated, but none have yet reached the stage of human clinical trials. The reason for delay is that there have been several challenges with developing a device for implantation into the mitral valve that have differed from those of aortic valve implants. The non-invasive mitral valve replacement device, or MitralSeal that is currently being developed in dogs, may be ready for implementation in this species, prior to the development of a similar device for use in humans. The challenges in the development of a transcatheter mitral valve implant to date have been associated with difficulties in achieving reliable fixation of the device. Unlike the typical calcified aortic valve annulus in humans, the mitral valve annulus is more pliable and lacks a fixed diameter. Therefore, fixation of a device within the mitral annulus has relied on factors that involve more than the radial traction between the annulus and the sides of the prosthesis. A second, less important issue, is that access to the mitral valve is inherently more difficult than that of the aortic valve via a transcatheter approach. The MitralSeal is a prosthesis made of porcine pericardial tissue that is mounted on a self-expanding nitinol stent. Fixation of the device relies on longitudinal traction and utilizes tethers to prevent displacement. Delivery of this device has been performed experimentally with a hybrid transapical approach and utilizes a non-steerable delivery catheter. Access to the left ventricle is gained via a small left thoracotomy. The pericardium is opened and a needle puncture is performed into the left ventricle. Angiography and fluoroscopy are utilized to ensure proper placement within the mitral valve annulus. Once the procedure is complete, a sealing cap is placed over the cardiotomy and tether fixation sites to prevent excess blood loss, and the thoracotomy site is closed (video of MitralSeal valve replacement procedure). Results to this point were presented at ACVIM this year. The MitralSeal has undergone chronic implantation successfully in normal pigs and dogs. Problems including perioperative bleeding, postoperative pulmonary edema, prosthesis displacement, prosthesis leak and perivalvular leak have all been addressed. The last remaining issue needing improvement, is the issue of prosthesis thrombosis. Pigs have been able to go multiple months without any apparent thromboses or the need for chronic antithrombotic therapies. Unfortunately, dogs have experienced significant thrombosis of the prosthesis within days to weeks of the device being implanted, even with antithrombotic strategies that have previously worked in dogs who have undergone open mitral valve replacement. Anecdotally, this suggests that dogs are more prone to thrombosis of intravascular devices than other species. Solutions currently being attempted include changing the prosthesis design to decrease areas of disturbed blood flow, different combinations of antithrombotic medications based on dual antiplatelet therapy and/or use of newer generation anticoagulant drugs. As presented at this year’s ACVIM, the future development of the MitralSeal will include clinical trials once the design of the device has been optimized and all the perioperative protocols have been established in healthy animals. Following this, placing the device in dogs with mitral valve disease will be attempted. Clinical trials have not yet begun. The initial veterinary trial will include a Phase-I type trial in client owned dogs and will be based on the principles of “compassionate use” and informed consent (compassionate use being treatment of a disease for which no effective alternative therapy exists). The primary purpose of the Phase-I trial will be to establish safety or feasibility of the device rather than efficacy. The goal of this study will be to demonstrate that the device can be deployed successfully and that it will function in a patient with mitral valve disease. An additional goal will be to demonstrate that the device is effective based on the ability to decrease or discontinue medications used to control signs of congestive heart failure for a meaningful period of time. It is anticipated that with this early study, modifications will be identified in the design of the device and/or the protocols for placement of the device based on inherent differences anticipated between normal animals and those with advanced mitral valve disease. The possibility also remains that dogs with advanced mitral valve disease may not be able to tolerate the procedure due to myocardial dysfunction that is anticipated with end-stage mitral valve disease. This early study will be performed at a single center. The next step in clinical trials will be a multi-institutional study in client owned dogs to demonstrate device effectiveness and durability. Efficiency would be compared to standard-of-care treatments in dogs with advanced mitral valve disease (i.e.- medical therapy of congestive heart failure). Although not yet available, the prospect of a mitral valve implant that does not require open heart surgery is exciting. If this device is able to be effectively placed and remain durable in the canine population, it could potentially revolutionize how we treat dogs with advanced mitral valve disease! http://blog.vetbloom.com/wp-content/uploads/2015/10/Featured-ECG-stethoscope.jpg 320 900 admin http://blog.vetbloom.com/wp-content/uploads/2017/01/VetBloom-Official-Logo-Small-e1485206678262.png admin2015-11-03 08:00:162017-03-28 07:40:05Non-invasive mitral valve replacement in dogs...is a viable option on the horizon? Look on Intstagram for help_save_sparky_pluggs and you will see her documentation of her dog saved in France this July. I have a 8 year old minature poodle she has this valve problem she is on meds 2 heart pills water pill 2 to 3 ti.es a day she is holding her own so to speak but i wished there was someone here in connecticut that could do this surgery cannot afford to travel to France if they come to the United States maybe I could afford to get her the surgery so she could live a longer life. Dr. Sabine Bozon and her team in France can fix your baby with a 98% sucess rate. I am going there. I have an eight year old toy poodle with MVD. I am really interested in this research and am hoping the technique will become refined enough to be successful and available everywhere. Did you take your dog? I have done the research and have been trying to find this guy. I have a 5 year old Maltese that has this issue and was given 12-18 months. She shows no sign of issues. I want to try as well, I love my dog so much. Hopefully there will be a fix to this issue soon. I have a 7yr old Maltese that is dealing with a Mitral cord tear and he is currently being maintained with meds. I don’t know how much longer he will hold on though. I have a 9 year old Maltese with mitral valve disease, a 4-5/6 murmur. 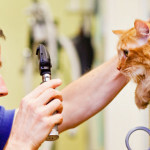 He is managed on meds, however i would like to find a surgical option for him. Is there one available? At this time, surgical options remain experimental and uncommonly performed. I have a 10 year d Shitzhu with a 6/6 earth murmur. He is managed on meds; however, do you have surgical option is available.